Rabbi Gershon Segal has served in the Orthodox Rabbinate for the past twenty-two years. He received Smicha from Rabbi Aaron Soloveichik at the Brisk Rabbinical College, Chicago, IL, and a degree in Psychology from Loyola University of Chicago. After receiving Smicha, Rabbi Segal remained a close talmid of Rabbi Soloveichik, whose guidance helped form Rabbi Segals hashkofa and whose sage teachings he regularly transmits to the members of our Shul. Before coming to the Boston area, Rabbi Segal taught at various Jewish educational institutions in the Chicago area and gave classes for several years at the Hillel of the University of Chicago. He then served for seven years as the Rabbi of Congregation Anshe Sfard in Milwaukee, WI. Rabbi Segal assumed his current position as the spiritual leader of our Shul in August of 1988. Under Rabbi Segals leadership, the congregation has experienced significant growth in membership and programming. 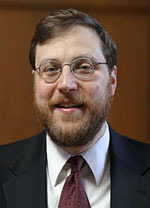 Rabbi Segals community work includes serving as the Orthodox Rabbinical Advisor and Posek for the Hillel at the Massachusetts Institute of Technology, serving as a member of the Maimonides Day School Educational School Committee, leading political activism on behalf of Israel, and strengthening Kashrus on local and national levels. Rabbi Segal is married to the former Tovah Soloveichik. The Rabbi and Rebbetzin have six children. Besides his official congregational and communal activities, Rabbi Segal is noted for his warm personal connection to each member of the Shul. He gives unstintingly and generously of his sage advice, guidance, and counseling, both in times of joy and in times of crisis. In February of 2001, Rabbi Segal was honored by the O-U with the Orthodox Union Rabbinical Centennial Award for his distinguished service to the Torah community and Klal Yisroel. The video from that memorable evening contains footage of our Shul on a typical weekday. To download that video you may click on the links in the blue box at the top of this page.